Accessory Genie - Consumer Electronics and Accessories Industry News: When an Alarm Clock is so pretty, you want to wake up! When an Alarm Clock is so pretty, you want to wake up! I have not met one person who said they enjoy waking up early in the morning to go to [insert noun, such as work, school, the gym, a doctor's appointment, etc]! It's not because they necessarily hate the task, but it's just the hassle of waking up that early! My sister sets three alarms: one on her phone by her bed, the other on her tablet which is on her bookshelf, and the final one on her clock that is in her closet (I guess telling time is not that important to her!). Wouldn't it be cool to have such a pretty alarm clock that you want to wake up each morning and see it? 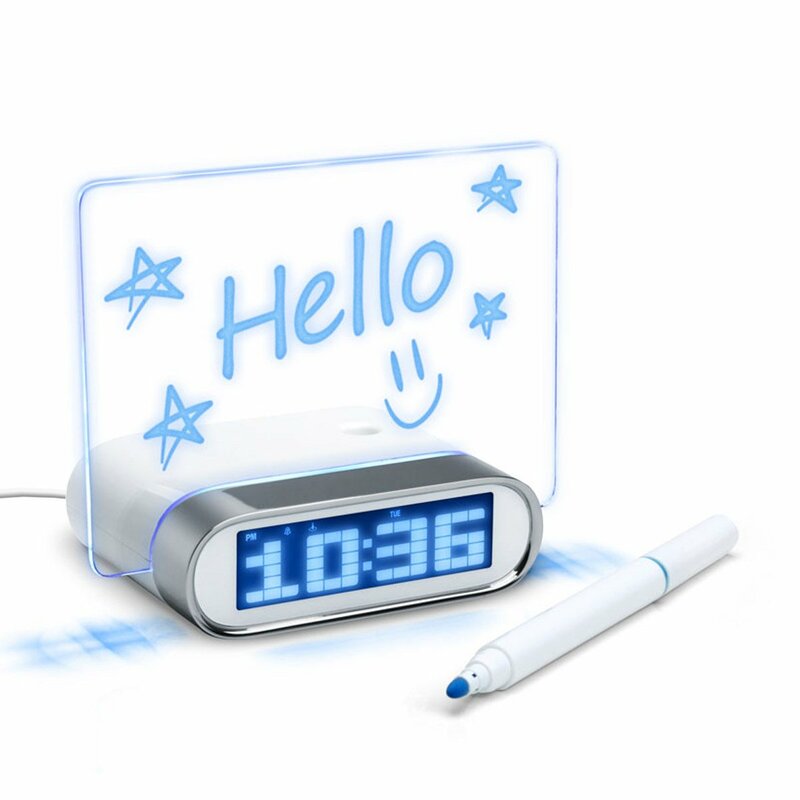 Luckily, something like this does exist: Enhance Memo Alarm Clock. Now don't get confused - this is not just ANY alarm clock! This device is powered by 3 AAA batteries or via USB. It has 4 - count 'em: 1, 2, 3, 4 - USB 2.0 ports attached, so you can give power to your cell phone, MP3 player, digital cameras, handheld game console, keyboard, mouse and more that offer a 500M/a! *Note: you cannot charge your tablet with this device. * You can also transfer data. There are two fluorescent wet erase markers included which allows you to write yourself a message (ie: "remember to take out the trash") or to tell your sweetheart something but don't want to wake him/her up, just write them a note. There's even a place to hold the pen. This Memo Clock can tell the temperature, date/year, as well as has a timer and stopwatch. It even has a birthday reminder and different alarm clock tones. And the best part: save 40% with the code from our newsletter.